Official logo of Sitka’s Sesquicentennial 150th Commemoration designed by Norman Campbell, Steve Dalquist & Tina Miller. Can you say “Sesquicentennial”? In 2017, Alaska will have been a U.S. possession for 150 years and the commemoration of this is called a “sesquicentennial.” It might be challenging to spell, or even remember, but it is certainly a landmark event on the local, state, national and international level. 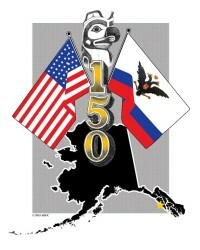 On October 18, 1867, the Transfer of Russia’s claims on Alaska to the United States officially took place in Sitka, Alaska. The Sitka Historical Society has committed to helping Sitka become the center of the 150th Commemoration with a year-long schedule of events and programs.